Blessing with raised palms turned outwards. 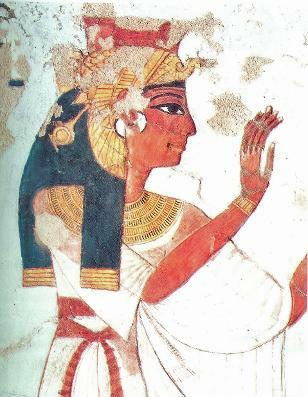 Deified Queen Nefertari giving the blessing. New Kingdom, Egypt. I move into a combination of the Queen and the Adorant blessing pose with my back straight and my right leg straight in front of the left. Megan sits next to me in her blessing pose. As I settle into the pose I shift my legs into a stepping forward Queen position, with my right foot moving towards another with the blessing. I see vultures flying above my head. They are on the look out for damage, ready to clean up any deaths/losses within their sight. The vultures transform the losses through ingesting the dead carcasses. The scope of the spiraling flight of the vultures during the pose moves from thenearby and local to the larger and global. They hold a greater scope and perspective of the world. Their purpose is to watch for what requires transformation. Heat surges up through my legs and I feel the clenching of my forehead. Unrecognized pain surfacing. Then the energy shifts into my hands as the blessing flows outward. The pain now located allows the blessing to reachs outward, beyond the pain. The vultures are the searchers and finders of the blessings. I leave this pose recognizing it as a practice that is needed every day. of our light in dark places. Let our sun help us to grow. in keeping our mother home safe. Let us find companionship with animals. Help our seeds to sprout new life. My aura is green and pink light is radiating from my heart center. I feel the energy from the moon coming through the heavens to my crown. The energy is pouring out my palms, more intense with each moment. Light is all around. Standing in my room, in front of my altar I experiment with the pose, my hands held up, palms outwards in the air in front of me. I imagine a grounding cord growing down from my body, into the layers of humus, earth, and water below our building. I sense what it feels like to have clear energy flow out of my palms, to radiate from my body in this blessing pose. I want to extend this blessing into four directions, to expand blessing into the space around me. I move my body around in four circuits, stopping to hold my palms outwards and imagine sending energy. I remember the teaching that we humans are an innate source of blessing for ourselves and others, a marriage of matter and spirit, transcendent and the oft forgotten immanent in-the-flesh, as sacred body. We don’t always have to evoke spiritual beings to bless ourselves and others, but can extend our energy forces and lives to be great sources of love and blessing in the world—we are love itself. We need to do this more, to incarnate our full potential as energetic embodied beings, as sources of blessing. Holding space to bless requires getting-out-of-the-way, once again, allowing a form beyond thought to lead me, a gentle love, a fierce love, of life. I want to bless my own body, in need of such, as well as my family, and this space, our home. I feel tingling energy flow outwards towards myself and others, and into our neighbourhood beyond. I started with an introduction of myself to the land in the way I am learning to be respectful of the ancestors of this land. Very aware that I have lived here for some while and not approached the land in this way before. Another great example of white privilege. I raised my hands in the blessing pose and immediately felt a strong pulsing energy pushing against my palms and fingers which were held vertically facing towards the outside. This sensation continued strongly, my arms grew tired and I was able to rest them on the arms of the chair while continuing to hold the pose. Calmness, acceptance of my presence and I had the sense of the beginning of a relationship one that has long been waiting my recognition as the basic connection needed with this land on which I live.